The Intel 845 chipset family is the bread and butter choice for P4 desktop systems. There is probably no other chipset family currently produced in bigger quantity and available in more mainboards than the 845. The 845 chipset family is becoming what the Intel 440BX chipset was a few years ago: It’s cheap, issue free, stable, high performing and regarded by many as the best chipset for overclocking a P4 system. What more could you want? Well, one could claim that the 845E/G chipset is lacking support for a few of the latest “features” like ATA 133, SATA, AGP 8X, and DDR 333/PC 2700. Well, ATA 133 is rather useless and seems to have no impact on hard disk performance. ATA133, as with all Parallel ATA, is a spent force, soon to be replaced by Serial ATA. There was good reason that Intel decided long time ago to simply skip this standard. AGP 8X has yet to show its benefit and first results with other chipsets don’t look very encouraging. Intel will bring AGP 8X and ICH integrated SATA support with the Springdale chipset due in spring 2003. After the first upgrade from 845 to 845E to accommodate the Pentium 4 Northwood processor with a 533 MHz system bus in mid 2002, Intel has now done another step to keep the 845 competitive. The latest version is the “PE”. What has been changed? 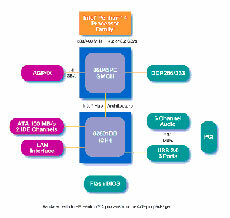 Intel chipset diagrams for i845E and i845PE. 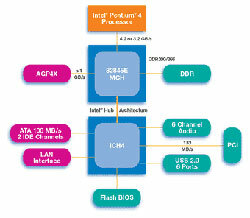 Looking at the Intel chipset diagrams it seems nothing much has been changed: only the Memory Hub Controller (MHC). The following chart is a condensed version of Intel’s chipset comparison. The feature comparison shows the evolution that the 845 chipset has taken from the original 845 to the recently released 845PE. Examining the specification sheet in detail we find only 2 differences the now released 845PE and its predecessor 845E. 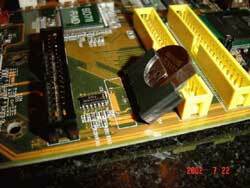 The 845PE is supporting non-ECC memory up to DDR 333, but no ECC memory. PC 2700/DDR 333 is a JEDEC endorsed industry standard. The added official chipset support for DDR 333 is of course a desired feature. But even this little change isn’t really a change, because most 845E chipset based boards like ABIT’s BD7-II and IT7 already support DDR 333 via a simple change of settings in the BIOS. Initially it was rumored that 845PE would be the first chipset to support Intel’s Hyper-Threading Technology (HT). The 845PE is indeed supporting HT but it’s not the first one as shown by the chipset comparison chart above. All 845 chipset versions including the not shown 845G, 845GE and 845GV are supporting HT. As HT is still relatively new we quote here how Intel is explaining this technology. Hyper-Threading Technology provides thread-level-parallelism (TLP) on each processor resulting in increased utilization of processor execution resources. As a result, an average improvement of ~40% in CPU resource utilization yields higher processing throughput. Hyper-Threading Technology is a form of simultaneous multi-threading technology (SMT) where multiple threads of software applications can be run simultaneously on one processor. This is achieved by duplicating the architectural state on each processor, while sharing one set of processor execution resources. Hyper-Threading Technology also delivers faster response times for multi-tasking workload environments. By allowing the processor to use on-die resources that would otherwise have been idle, Hyper-Threading Technology provides a performance boost on multi-threading and multi-tasking operations for the Intel® NetBurst™ microarchitecture. We tested a few weeks ago the IT7 MAX 2 Version with the 845E chipset and came to the conclusion that this is one of the best performing 845E boards and an ideal platform for overclocking. Such a well performing piece of hardware is not easily replaced with something unknown. But with any new chipset comes the subconscious hope for a magic “breakthrough”. The change from Version 1 to Version 2 was made easier by the fact that ABIT apparently changed ONLY the chipset, and nothing else. Features, board layout and the package content remain the same, at least at first glance. Later we found some subtle differences. This test report is therefore focusing on the performance difference between the IT7 MAX 2 845E and 845PE versions. The IT7 MAX 2 Version 2 shown in our picture is one of the first production samples, which are –according to ABIT- erroneously made with a brownish PCB. This is good, because black looks much better. 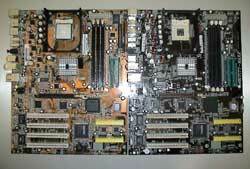 The original IT7 MAX came in the same brownish PCB. The second generation the MAX 2 Version 1 looked much more impressive in black. Another obvious change is that finally the battery is now mounted flush with the motherboard instead of standing. A while ago we tested a BD7-II with exactly the same standing battery that the earlier IT7 versions are also sporting, and found it knocked down when we opened the box. 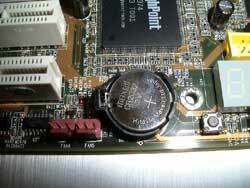 The "standing" type battery, broken on our BD7-II. The preferred flush-mounted battery of the V2.